Zsaberlink, author of the Elements of A Link to the Past article that was posted just weeks ago, has created a bunch of notes, a complete guide, as well as a full review of one of the hidden treasures in the Zelda series, the Ancient Stone Tablets. You can check out the introduction of his Ancient Stone Tablets Article over at Zsaberlink’s blog. How many Zelda fans out there have actually heard of this title? 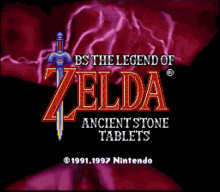 The Legend of Zelda: Ancient Stone Tablets was a downloadable game released in 1997, built using the same game engine from A Link to the Past. The game was originally made for the Broadcast Satellite, an add-on modem to the Super Famicom system (Japanese version of the Super Nintendo). The game is quite rare because it doesn’t exactly exist in the same form as the rest of the Zelda titles. It wasn’t a cartridge based game, but rather, it was a downloadable game that was only available during specific times in the month of April 1997. To find up more information, check out the Ancient Stone Tablets page over at Zelda Wiki. Read on to find out more about the game and to get a glimpse of Zsaberlink’s article. Zsaberlink has created a full guide of the game, highlighting each dungeon and all the familiar bosses. You can check out Part 1 of the guide and just by looking at some of the screenshots and glimpsing over the text, you can see the obvious similarities to A Link to the Past. It uses the same graphics and game mechanics as A Link to the Past. Many of the level designs do look familiar but they are in fact unique dungeons. The game uses several of the same bosses from A Link to the Past as well. After giving some Background Information of the game and providing a full guide, Zsaberlink concluded his blog article with a full review of the game and had this to say. Simply put, Legend of Zelda: Ancient Stone Tablets would be hard-pressed to stand on its own as a full-fledged console release. It is truly an enhanced second quest of a Legend of Zelda: Link to the Past, and as such a game it was very well done. For anyone who has played a Link to the Past, basically every puzzle, every boss, and every enemy can be seen in its predecessor, but was combined in different ways to create different dungeons, and a slightly altered world. If you were to compare everything in a Link to the Past compared to Ancient Stone Tablets, nearly everything in the latter game is inferior. This is partly due to its downloadable nature and the time constraints it was to be played in. These constraints led to the dungeons themselves to be rather small compared to those of the original, and the quest is much easier than that of a Link to the Past. These properties, however, serve the game’s true purpose very well. Hopefully someday the rest of us Zelda fans we’ll be able to enjoy this hidden treasure on a Nintendo console. It seems unlikely that this will ever happen, so in the meantime you can head on over to the fansite BS Zelda, where there is information on where you can download the game to your computer and play it on an emulator.